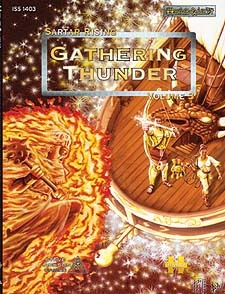 Gathering Thunder! continues the saga of Sartar Rising. As the heroes have become more deeply involved in the Rebellion, the Empire has consolidated its forces in Dragon Pass. It is now beginning an ambitious new effort to crush the rebels by builidng a Temple of the Reaching Moon, able to bathe the whole of Sartar in Lunar magic. The heroes proved themselves at Iceland, and now they will find themselves playing an increasingly important role within the Kingdom as they make allies, raid their enemies, save loyal clans, and finally join Kallyr on a heroquest through the Sky itself to create a new planet and talk to a dragon. * The New Breathers - After Iceland, the heroes take on new responsibilities and have the opportunity to win a powerful ally for the Rebellion. * Sheep, Clouds, Thunder - when gaining a great treasure involves striking a blow against Lunar collaborators, how could any true Orlanthi ignore the challenge? * The Other Side of the Dragon - For the Rebellion to succeed it needs allies, and perhaps there are none better than those it once regarded as enemies, such as the proud Grazer horse nomads. * Final Days at Skullpoint - All is not as it seems with the Skullpoint Clan, as the heroes discover when they travel high into the remote foothills of the Storm Mountains. * Orane's Spindle - The Rebellion may gain allies, but can it keep them? The heroes must save a friendly clan that has lost its greatest treasure to a malevolent threat from its own dark past. * The Sky Ship - When Kallyr asks the heroes to join a great quest into the Sky World, they must answer her call. From the rituals of an obscure stellar cult, to a harrowing chase across the Sky, to the journey along the Clestial River on the Sky Ship itself, the heroes will experience and learn more than they ever have before in this prelude to the devastating rituals and epic adventures coming in Dragonrise, the fourth book in the Sartar Rising campaign series. * Narrator Rescources - Rivals, enemies, and new information to help the narrator run and personalize the adventures in this book.